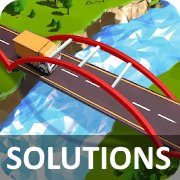 Path of Traffic - Bridge Building solutions 3 stars + extra objectives all levels, for android, iphone, ipad and ipod. Are you a qualified bridge architect? Give it a try on our Path of Traffic- Bridge Building! Path of Traffic - Bridge Building is a clone of Build a Bridge, so all the levels are actually identical! So if you didn't yet played Build a Bridge you can use it's solutions if you get stuck.